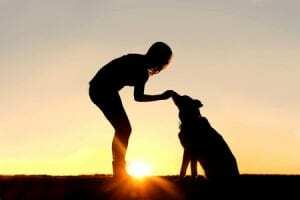 Your dog is your best friend—but like any relationship, it takes effort and thoughtfulness to bond. On a regular basis, spend one-on-one time with your pup. Go for a long walk, pl ay an extended game of fetch or just cuddle together on the couch. Either way, make sure the activity lasts at least half an hour and put the smartphone away—your dog can tell whether he has your full attention or not. Training your dog provides her with positive reinforcement and leads her to see you as the giver of all good things (read: treats). Dogs want to please us, so training is a great way to bond. Your dog needs consistent boundaries in order to feel safe. Don’t let your dog sleep in your bed one night and insist that he sleep on the floor the next. Dogs are happiest when they know what is expected of them. Affection is an essential component of bonding with your dog. Show your pup how much you care by doling out regular head scratches and belly rubs. At Family Puppies, we know all about bonding with dogs. Check out our adorable selection of French bulldog, Havanese, Coton and Cockapoo puppies—you may meet your new best friend! Our puppies are like family—our four sons and two daughters bond with them every day. Contact us today to learn more.